In 2015, I met Steve Moughin from the Sam Bush Band for the first time at the Blue Ox Festival in Eau Claire, WI. If someone didn’t know what the Blue Ox Festival was, one might think it had something to do with Paul Bunyan, and Babe, his over sized cow. While this is not actually the case. The Blue Ox Festival is one of the best Jamgrass Festivals around featuring amazing talent in a timeless setting that makes the date pretty firm on my calendar. Steve was kind enough to let me take my picture with him and as a bonus I also was able to get a picture of Sam Bush that was pretty cool too. Two years later at the Blue Ox Festival the Sam Bush band was back again. I think they may play it every year, but anyways, I was very busy running around backstage talking and getting to know some of the other bands. With backstage activities, jamming and taking pictures, we didn’t get much time to chat. So, I later Facebook messaged him to see if he would consider doing an interview with me and he cordially said yes. What a guy! What a guy! Enough about how the interview came about and on to the interview. Click here to read it: INTERVIEW WITH STEPHEN MOUGIN guitar player from the Sam Bush Band and be sure to check out some great information about Steve Mougin below. It didn’t happen on accident. For Stephen “Mojo” Mougin’s career trajectory, it was fate: when Bill Monroe signed Stephen Mougin’s mandolin at the Peaceful Valley Bluegrass Festival in summer 1988, and then used it in a workshop. Talk about a good omen, because now Stephen Mougin is one of the most respected Jack-of-All-Trades in acoustic music. A compassionate teacher, compelling touring guitarist, natural songwriter, sought-after producer, and gifted sound engineer, Stephen Mougin is a go-to guy for pretty much anything under the musical sun. Mougin is most naturally a vocal teacher, having earned a degree in music education with a vocal focus from the University of Massachusetts – Amherst. Mougin teaches voice through workshops and lessons, with one student or in group form. He also teaches guitar and mandolin, and offers zeroed-in focus on each student’s work. “[Bluegrass voice Teaching is] about knowing which rules you can break or bend to make it sound authentic,” he says. Mougin’s proven method starts with the fundamentals, and then he works with the student on developing their own style. Mougin has released instructional CDs through his label Dark Shadow Recording on baritone and tenor harmony vocals (with help from Russell Moore, and Ronnie Bowman), and a comprehensive fiddler CD featuring Megan Lynch. “Of all the things I am, the thing I do best is teach. The results are tangible, and it’s where I have the most confidence,” Mougin says. Taking a leap into the world of playing music professionally, Mougin moved from the East Coast to Nashville in 2002 to play mandolin with Valerie Smith, but soon switched to playing guitar. Playing with a supportive band leader made Mougin feel more empowered in his career, which lead him to pursue other creative outlets like Nedski and Mojo, his duo with banjo player Ned Luberecki. Luberecki is a broadcaster for SiriusXM Bluegrass Junction, and plays banjo in Chris Jones and the Night Drivers. Nedski and Mojo tour together in the off-season and hold workshops on the road: banjo, vocal, duets, harmony. The pair was clearly meant to play together, as their artistic chemistry and genuine friendship exhibits, leaving them a much sought-after duo. Through playing professionally in Nashville in the early 2000s, Mougin was intrigued and encouraged to learn more about producing and sound engineering. In 2005, he launched Dark Shadow Recording, a studio out of his home, named from the title of a song he wrote called “Dark Shadows.” Now, the record label is booming with four acts to its name: The Rigneys, Nedski & Mojo, himself, and newly-signed Becky Buller. “Stephen is an excellent producer with very musical ideas. He brings with him years of road experience with the Sam Bush Band and others, as well as a degree in vocal pedagogy. He’s committed to keeping every session fun and stress-free and he knows just the right mic to make my fiddle sound like dark chocolate mousse with sprinkles and cream on top. I love working with him!” –Becky Buller, artist. 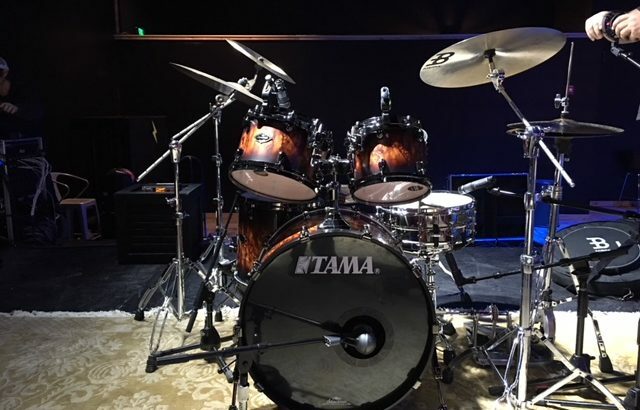 Dark Shadow Recording serves as a recording space, record label, production studio, and produces instructional recordings of drum tracks. The Rigneys’ Double or Nothing was released in 2013, and Becky Buller’s new project is currently in the recording process with a 2014 release. Mougin is also a songwriter who has several songs to his name recorded by bluegrass artists like The Infamous Stringdusters, Melanie Cannon, Fragment, The Bankesters, Terry Baucom, Cages Bend, Chris Jones and the Night Drivers, The Rigneys, Missy Werner, Kristi Cox, and Nedski and Mojo. Stephen Mougin exemplifies a renaissance man for the music world. He is always seeking new ways to create, explore, grow, and develop – all for the sake of making music, and helping others. For all his credits and accolades, you’d be surprised at his friendly, trustworthy, and approachable demeanor. Mougin is married to Jana Dolakova Mougin, a native of Slovokia, and singer and bass player of the European bluegrass band, Fragment. Jana owns Blue Danube Bakery, out of Nashville. They have a son, Sammy, who is 4. When Mougin has time for himself that when he enjoys non-musical things like fishing and listening to classic vinyl. Okay, that last one was music, but it still counts! Now, a member of the Sam Bush Band. If joy were a person, he’d bring both peace and frenzy. He’d be full of music, light, and energy that soothes even as it stirs us up. Eyes closed, wire-rim glasses in place, mandolin pressed against his ribs, joy would be Sam Bush on a stage. “When it’s time to play, once the downbeat starts, my mind goes to a place that’s all music,” says Bush. The joy of the music comes to me and overtakes me sometimes-I just become part of the music. Merging of life and art fills Bush’s new album Storyman, a collection from jazz, folk and bluegrass to create a jubilant noise only classifiable as the Sam Bush sound. For Bush, a lifetime of channeling his energy has led to innovations that have changed bluegrass and roots music. Bush took about four years to record the latest installment in that legacy. “It’s still important to me that all of the songs fit together on an album,” he says. “I’m well aware that people buy individual tracks digitally, and that’s good. But I still think of it as an album-a body of work. “You know you’re in love when you ride the Greyhound bus.” Humanistic optimism punctuates the entire album. “Play by Your Own Rules,” co-penned with Stephen Mougin, encourages listeners to be themselves. Written with Deborah Holland, “Everything is Possible” offers a reggae-infused instrumentation that matches the positivity of the lyrics’ messages. The wryly funny “Hand Mics Killed Country Music” brings Emmylou Harris and Bush together again. Harris contributes harmony vocals on the song, which the two co-wrote. It’s a straight-ahead honky tonk shuffle-the first that Bush has ever recorded on one of his solo albums. “I thought the song really needed that great, old-time piano, like Pig Robbins. Then I thought, ‘Well, call Pig Robbins! Not a younger player who can sound try like him!’” The session player accepted the gig and guided the bluegrass- and jazz-trained musicians through the art of creating a shuffle. “Carcinoma Blues” has co-writer Guy Clark’s fingerprints all over its lean lines and inimitable combination of cleverness and heart. Clark and Bush have both had their bouts with cancer, and Bush wanted to write about the experience, directly and holistically. “We wrote it from the points of view of both the patient and of the loved one, who’s watching the patient go through it,” Bush says. Echoes of Jimmie Rodgers’ “TB Blues,” which Bush says “scared him as a kid” reverberate throughout the track.